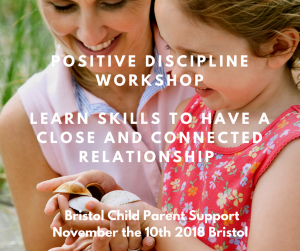 Is love in your family becoming a battlefield, are you finding it increasingly difficult finding strategies for positive discipline? New research published in the Independent reported that parents argue at least 49 minutes a day, the average spat is 8 minutes. Researchers who surveyed 2,000 parents of children aged two to 12 revealed many find themselves falling out with their offspring about what they want to do, eat or drink on a daily basis. it notes that “Parents will ‘win’ just over half of the rows, as six in ten mums and dads admitted they often end up compromising to keep the peace. So let’s prevent the conflict, arguing, the nagging and learn some Positive Discipline Strategies for a “win-win” for everyone. During this Positive Discipline workshop, you will: THIS WORKSHOP IS FULLY BOOKED, thank you, everyone! Use parental attention and presence, how to use Play and Praise and empathy effectively. Focus on setting boundaries without using threats. Be an emotion coach for your child. No more than 10, my intention is that everyone who attends can ask questions and share in a small and intimate setting. Do I have to take notes? A powerpoint handout of the presentation is provided with some key handouts. It is £35 and to secure a place, you need to pay in advance. It is not refundable but if you unable attend, maybe you can gift it to a friend.